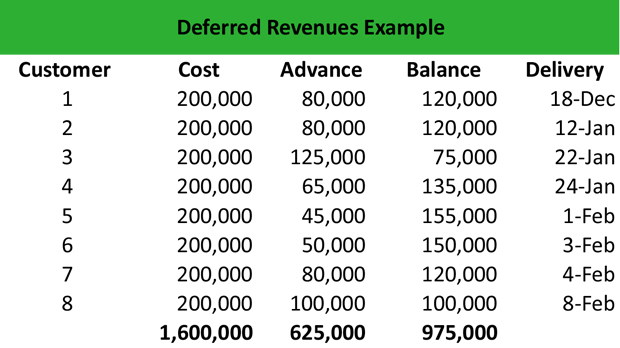 Home » Accounting Dictionary » What is a Deferral? Definition: A deferral, in accounting, is to put off recognizing income or expenses on the financial statements until they are incurred. What is the definition of deferral? Generally, deferral refers to prepaid expenses or revenues that a firm makes. For instance, the insurance payments that a firm makes precede the coverage period. Hence, the cost of insurance is deferred on the balance sheet until the next payment. Similarly, a firm may receive a prepayment for a customer order. These are prepaid revenues, which are deferred on the balance sheet until the order closes. Company ABC is a large manufacturing company with a large customer base. The company has received a lot of orders for manufacturing a new equipment, and many customers have put an advanced payment to verify the order. Adam, the company’s accountant, want to list the down payments of clients to get an idea of deferred revenues. Eight customers have made a total advance payment of $625,000, and the equipment will be delivered to them between December 18 and February 8. As soon as the equipment is delivered, the customers will pay their balance amount, and the order will close. Until then, the company will report the respective amount on its balance sheet as deferred revenue. Adam wants to calculate the deferred expenses as well pertaining to the company’s insurance payment. The company pays $10,000 for insurance coverage on December 15 for the coverage period December 31 – June 30. On June 15, it pays another $10,000 for insurance coverage for the period June 30 – December 31. Therefore, the company prepays its insurance coverage and reports $10,000 as deferred expenses until June 15 that the next payment takes place. Define Deferrals: Deferral means to the recognition of certain expenses or revenues on a firm’s income statement after they take place. 1 What Does Deferral Mean?